Hi everyone! I crushed this look today. 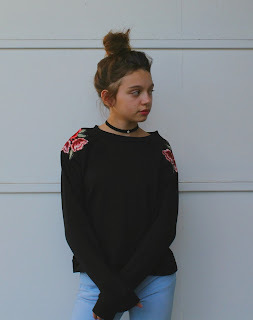 The minute I saw this embroidered sweatshirt I knew I had to get it. 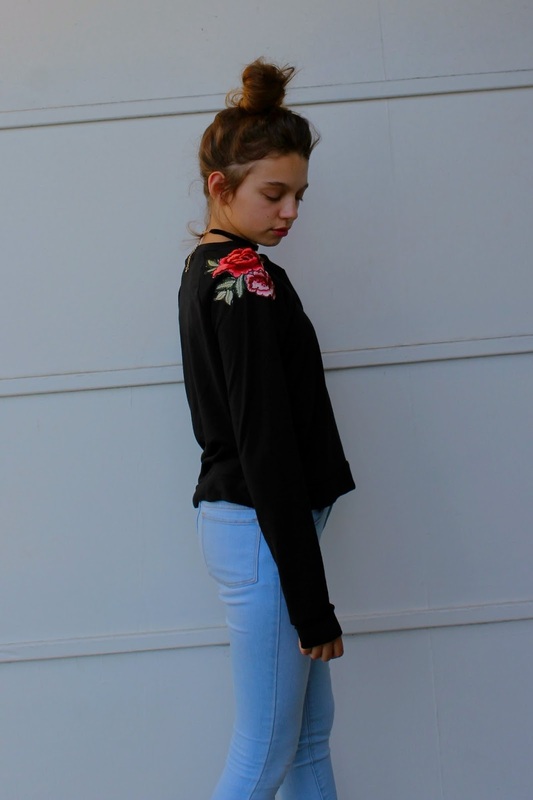 This sweatshirt is by Atticute, it has beautiful rose detailing on the shoulders and turns what would be an ordinary sweatshirt into a pretty piece that goes well with my jeans, making it a cute but casual outfit. Great for hanging with the friends at the mall. These cute and stylish skinny jeans are from Old Navy. The jeans are simple, comfortable and are a light washed denim. I wanted to add a little heel to my outfit so I stepped into these beautiful low booties by Jessica Simpson. The detailing on the back of these bad boys is pretty cool. The boots are versatile and can be worn with jeans or a pretty dress or skirt for a night out. And they are pretty comfortable to walk around in for hours. I tied the outfit together with this velvet choker that has a bit of bling to add some sparkle to my outfit.